4 wheel drive Farm Tour of the 2000 ha farm. Join Bruce and enjoy a guided tour of our hill country property and take in some amazing scenery with tussock clad hills and mountain views. Karetu is situated approximately 63 km north of Christchurch and a one hour drive from Christchurch airport. The farm is 2000 hectares of some flat to rolling downs but mostly hill country land on which we graze sheep and beef cattle. We are situated along the south branch of the Waipara river. Karetu Downs is not just a farm it is a way of life. The property is home to around 4500 Romney sheep and 120 Angus cattle and has been owned and operated for over 3 generations by the Forrester family. Take in the breathtaking views from the top of the tussock clad hills to the fascinating perfectly round boulders along the river bed. These spherical stones or concretions can be found in varying sizes dotted along the river bed that runs through the farm. We love watching the reaction of our guests when they bottle feed lambs, experience sheep shearing or marvel at the view from the top of the farm. - Bottle feed the pet lambs (seasonal) around August/September. - Meet Barney our resident Donkey plus Wilby and Ginger the Kune kune pigs. - Hand feed our pet sheep. Help feed the chickens and collect the eggs. - Watch a sheep shearing demonstration or if you are lucky you may get to experience the shearing gang in full swing around May/June/July. - Join Bruce on a guided 4 wheel drive tour of the farm (by arrangement). - Join in the annual tailing of lambs in spring usually around October/November. - Fishing for brown trout along the south branch of the Waipara River or take a trip to the Hurunui River 25 minutes away you may catch a salmon or a trout. - Farm walks and hill country trekking. - Bring your own mountain bike for an adventure tour around hill country tracks. - Rabbit shooting (night spot lighting is also offered please ask). - Join the boys on a pig hunting expedition usually during the week end (by arrangement). - Just relax and enjoy the wide open spaces and tranquility of rural life on a farm. There is always something happening on a working farm so why not come and see for yourself ... we know you will love it! - Amberley township is 20 minutes drive away with a good selection of shops and restaurants (including the well known Nor' Wester Cafe). - Pegasus, Amberley and Hawarden Country golf clubs are all close at hand. - Easy day trips to Whale Watching at Kaikoura and the Hamner Springs Thermal pools. - Easy day trip to Mount Lyford ski field. 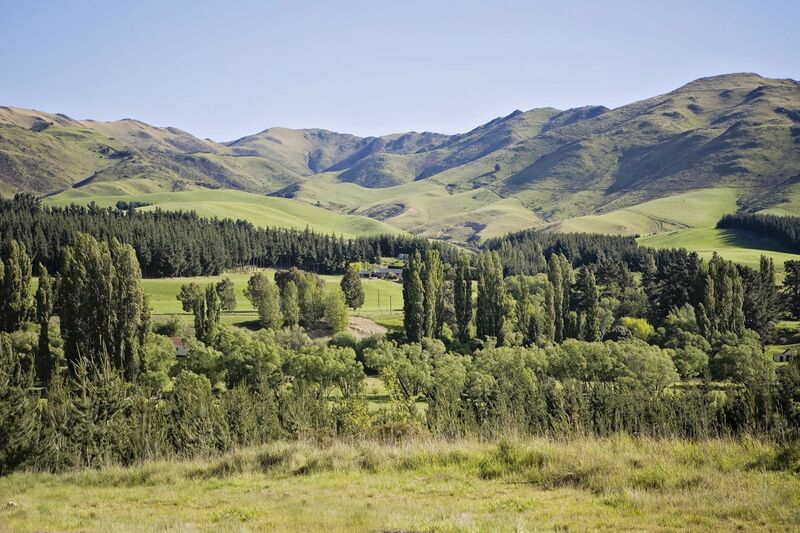 - We are 15 minutes from Waipara Valley vineyards and cafes and 20 minutes from the Weka Pass Railway. Great walking tracks, river walks, wild life, hill country views and close to Waipara vineyards and cafes. We have many farm animals for children to meet and feed. Barney the donkey, Ginger and Wilby the kune kune pigs, chickens, pet sheep and Jaz the Flemish giant bunny. The Musterers Studio is attached to the 100 year old Homestead and comes complete with a corrugated iron exterior. It has been tastefully restyled to reflect the ambiance of staying in traditional NZ country farm style accommodation. The apartment has a comfortable super King bed with stylish bedding, warm duvets and cuddly throws. The welcoming fire place and cosy furnishings provide extra charm. The adjoining en-suite has a modern shower, bath robes, hair-dryer, cuddly towels and complementary soaps. Laundry facilities are also available in the Homestead. Sky TV and WIFI are available in the room. The Louisa Suite has a comfortable queen size bed complete with a wool rest, electric blanket and cuddly duvet. The modern ensuite bathroom adds a touch of class to this lovely character home and complements the guest room beautifully -complete with bath robes, hair-dryer, cuddly towels and complementary soaps. The Suite has its own adjoining private lounge and verandas which open out on to large attractive gardens. The lounge has Sky TV and WIFI, a welcoming log fire and cosy furnishings. Free use of the outdoor spa pool. Laundry facilities are also available in the Homestead. Log fire in the private guest lounge. Sky TV. Dinner available on request please email prior to arrival to arrange booking a meal. Laundry available on request. The house faces the northwest and is positioned well for full sun and looks out into the front garden. Tranquil setting with north facing patio and BBQ area enjoys wonderful views of Canterbury foot hills. Use the tranquility of the hills as a backdrop to relax under the stars. Well heated with log burner in lounge and night store heating in hallway. Campervan site with toilet/shower/kitchen facilities in the wool shed. Closest dumping area is in Amberley for the camper vans. Tent site with toilet/shower/kitchen facilities in the wool shed. The Farm stay began in 2012 when we decided it was time to do something a little different. Visitors to Karetu would comment about how lucky we were to have such an idyllic place to live, and we decided to start sharing it. The best part for us is meeting guests from all around the world, and being able to share with them our love of the land and this place we call home Aotearoa - New Zealand.